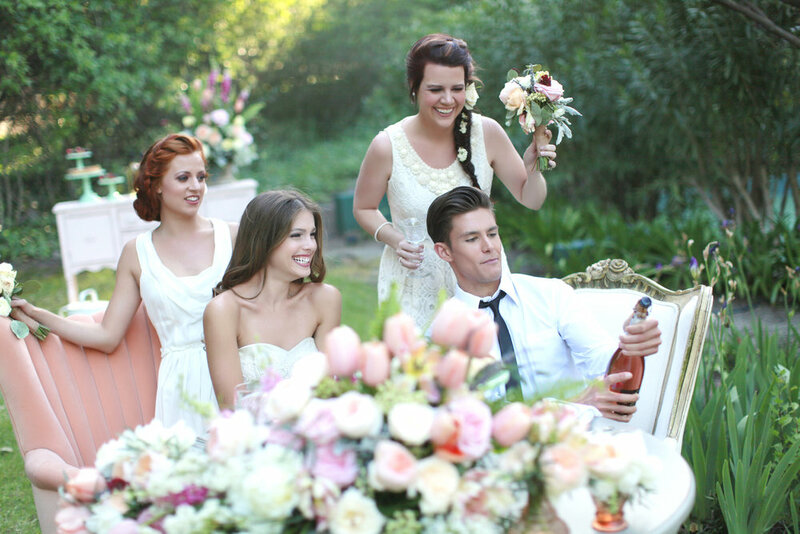 This Vintage Parisian Wedding style shoot was set at the beautiful Saddlerock Ranch in Malibu Canyons. We were lucky enough to work with a very talented group of vendors to put together this romantic affair. To see our full feature and even more photos check out Adorn Magazine. Paris is one of those places that is filled with beauty and romance around every corner. Kimberly Paolone of K. Rae Events was the perfect person to design this style shoot. She chose all the right elements to create that magical feeling of Paris. Our inspiration for this shoot led to beautiful and playful floral arrangements with peach and coral flowers accented by lush, dark greens. These arrangements and all of todays images were artfully captured by Valerie Tabor Smith. We fell in love with the whimsical treats created by Frost It Cupcakery. The whimsical macaron cake tower, which was made of eclairs and tarts, provided for a very French dessert bar. Pretty Vintage Rentals brought all the inspiration together with their darling rentals which included a vintage blue bicycle. The sweetheart table was also adorned with their charming mismatched china. We couldn’t be more excited to have worked with such a great group of people to put together this vintage Parisian shoot. Quail Ranch provides a picturesque and classic California setting and is the ideal location for your next event. This 70-acre working avocado and citrus ranch features a natural landscape and unique backdrop with 200 year old oak trees and gracious star pines. The estate home built in the 1930’s is of classic Spanish Revival architecture, adding charm and beauty to the property. A hidden gem on the hill, Quail Ranch provides an intimacy and rustic elegance that is a unique and authentic California experience. A short drive through the beautiful Tierra Rejada Valley from the west, the ranch is well situated between Los Angeles and Ventura. To see more of this wedding check out our features on Wedding Wire and The Frosted Petticoat. The design for our stylized shoot was a collaboration of ideas from Heather Wismann & Laurie Comeaux of Unique Floral Designs and Andrew Evans of Party Pleasers, to enhance and showcase this stunning venue. The beautiful peach and cream flowers by Unique Floral Designs were designed to create a lush garden feel with whimsical touches, including the silvertree leaves as napkin rings. Foliage used was of similar type that grows on the property. The furnishings selected for both style and comfort complimented the landscape. Lace linens and wood chargers mixed beautifully with the crystal goblets on the feast table. The mix of upholstered chairs and benches with vintage wood chairs added a fun and comfortable ceremony area. The vintage wrought arch perfectly framed our bride and groom. The delicious hors d’euvres were created and artfully displayed by Command Performance Catering. To compliment the food, Magnavino Cellars provided their award winning wines which paired deliciously. Alyssa looked stunning in a soft blush custom wedding gown by Elizabeth Mackenzie. The dress was hand crafted to compliment Alyssa’s figure and unique style. The cascading layers of skirt moved playfully while she walked down the aisle. Rose sequins caught the afternoon light and hid an elegant low cut back. The models hair and make up by Jana and Co. Hair and Makeup perfectly enhanced the complete look. The Michael Kors tuxedo from Friar Tux gave our groom the classic elegant look you would expect. The wedding cake by Skiffs Cakes looked elegant with the intricate lace patterns on each delicious layer. Every detail was captured by the discerning eye of Kimberlee Miller Photography using the natural light and beautiful landscape of this extraordinary venue.